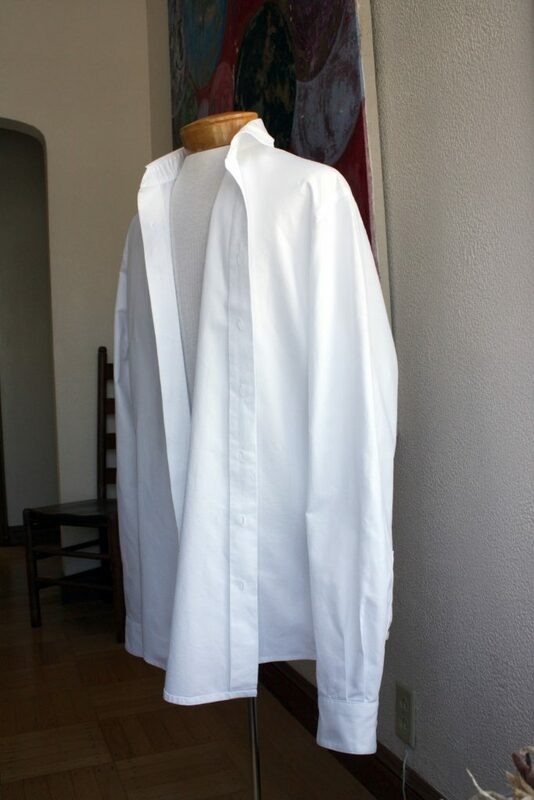 Welcome to Part 2 in a three-part series on fitting a shirt muslin for my partner. In Part 1, we had discussed the importance of balance, as it affects the way the grain of the fabric hangs on the body. I attempted to drape the neckline, armholes, and shoulders to better match the body, but I made a mistake – I did this all before trying to get the garment into balance. The balance alterations caused several side effects with the other fitting adjustments, which complicated the fitting process. This entry was posted in Clients, Pattern Fitting, Shirts and tagged bf-oxford-shirt on May 29, 2017 by mportuesisf. 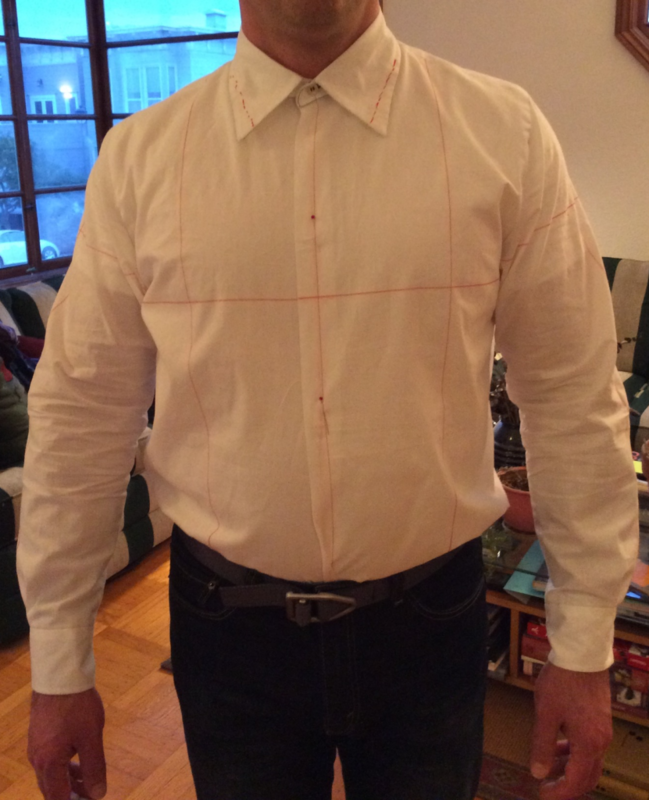 This article embarks on a three-part series, showing how I approached the fitting process for the BF Oxford Shirt. I’ll start by saying I’m not a fitting expert. So some of this narrative will seem like a “two steps forward, one step back” sort of process (or even “one step forward, two steps back” in my case!). As I understand it, that can even be the case for professionals who work their way through fitting a client. Fitting is a problem solving exercise, and sometimes experimentation is in order to find the best solution to a problem. But what I will do is try to share some of the principles I’ve learned, and how I applied them in this process. And in fact, while going back over my notes to write these articles, I’ve made some further realizations about the fitting adjustments I made and their effect on the garment. 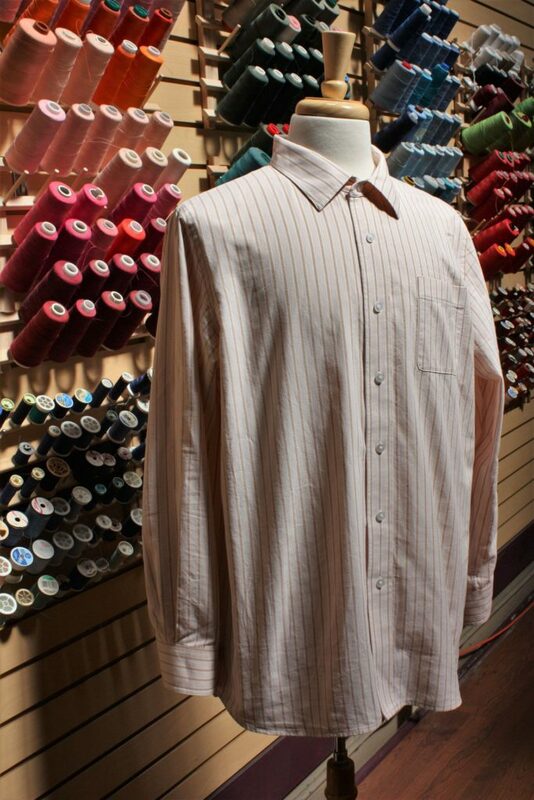 This article begins a series on a recently completed dress shirt for my partner, Jim (hereafter referred to as “the Client”). As with many of my projects, this one is a side quest: the original plan was to design a chambray work shirt for him. Since I last made shirts for him based of Kwik Sew 2000, I realized his body proportions have changed due to many hours at the gym. The shirts are now a touch too small, particularly in length. Plus, I’ve developed my fitting skills since I made those shirts and I thought the overall fit could be improved. Six fitting sessions, over a period of several months, got me to the point where I was happy enough to go ahead with this shirt – which I think of as a wearable muslin. In a reversal from my usual presentation, I’m opening with the finished project. Future articles will talk more about how I got here, starting with the original Kwik Sew 2000 pattern. This entry was posted in Clients, Completed Projects, Shirts and tagged bf-oxford-shirt on May 12, 2017 by mportuesisf. Greetings after a long absence. My personal life has been rather hectic lately, and after completing the shirt for my client’s wedding I took a break from sewing for a while. Readers who have followed the Tuxedo Shirt saga to this point will know I actually made two shirts. The first was from a fabric that looked beautiful but was prone to wrinkling. Since the wrinkly shirt was largely complete, I took time over the past week to finish this shirt for the client. I personally put a lot of effort into it, so I did not want to see it go to waste. This entry was posted in Clients, Completed Projects, Shirts and tagged tuxedo-shirt on June 16, 2016 by mportuesisf.